Commodity options are options having a commodity futures contract on goods like wheat, gold, silver, crude oil, and many other goods as the underlying. For example a gold futures options contract gives the owner the right, but not the obligation, to buy or sell a nominated quantity of gold for the price specified in the contract. These type of options are swiftly traded by open outcry on one of several exchanges. Therefore the option price may change rapidly and without warning. To offer speculators additional control over the price paid (or received) specific order types have been created to enable you to stipulate conditions which must occur prior to purchasing the option. Unlike stock options, a commodity options contract must include more specific things such as the commodity futures contract being traded, whether the options are call or put, the number of units being bought and sold, the expiration date as well as the strike price. In short, commodity options are the ideal help to traders because they provide an insurance against the price volatility. In essence, commodity options function just like stock options. Both give the buyer the right but not the obligation to purchase or sell for a pre-determined price within an agreed time frame. Having said that, inherent in commodity options are a number of advantages, the primary ones being: margin, diversification, implementation of strategies and fairer pricing. The commodity markets utilize SPAN* - Standardized Portfolio Analysis of Risk. SPAN is a risk based, portfolio approach for computing margin requirements in an account for futures and options on futures. Developed by the Chicago Mercantile Exchange, rather than calculating the margin for a new position put into an account, SPAN works out the effect the new position has on the whole account. Put simply, it recalculates the portfolio as a whole. The majority of participants in this market buy and sell commodities in the cash market and use options to hedge their risk. Among brokers this is called the spot market because the entire cash value of the commodity is paid "on the spot". The commodity options are offered in several over-the-counter markets and exchanges. Commodity options are becoming more popular with equity options traders. We’re witnessing a lot of equity option traders move to commodity options because commodities are so much in the headlines and because people have a tendency to gravitate to where the action is. The concepts, strategies and know-how for equity options can be easily transferred to options on futures. Trading commodity futures and options involves considerable risk of loss and might not be appropriate for all investors. You ought to carefully think about whether trading is suitable for you in light of your circumstances, expertise and financial resources. Physical settlement of commodity futures contracts requires the physical delivery of the underlying commodity, typically at an accredited warehouse. The seller who is obligated to make delivery will have to take the commodities to the chosen warehouse and the buyer intending to take delivery must visit the designated warehouse and collect it. This might seem straightforward, but the physical settlement of commodities is actually a complex process. Most futures contracts do not result in the actual physical delivery of the underlying asset. The settlement of commodity options is made by closing out open positions, physical delivery or cash settlement. Each one of these settlement functions are handled by an organization known as clearing house or clearing corporation. The settlement guarantee fund is maintained and managed by exchange. 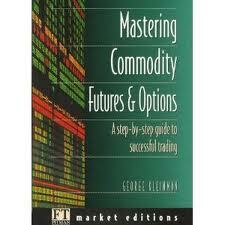 Commodities can be categorised into major groups like grains, metals, meats, financials, or stock or future markets. Once you know the group that a commodity is from, it is quite easy to determine which exchange or exchanges the commodity will be traded on. The exceptions might be silver, gold, as well as the financials. The two precious metals are traded actively on more than one exchange.